Spend your days shopping in town or lounging at the beach. Choose from three unique cottages, each with their own perks. Stretch your legs on bike, swimming the Atlantic Ocean or walking the sandy beach. Visit Cape Ann's shops, art galleries and seafood restaurants. If you are looking for summer rental in Rockport, learn more about the lovely Cottages at Rockport. Whether you want to spend your vacation shopping in the town or relaxing at the beach, the Cottages give you easy access to these activities and much more. Of course, the lodgings themselves are just as lovely and unforgettable as the natural and man-made beauty surrounding them. In addition to these features, each of the three cottages has its own unique perks. 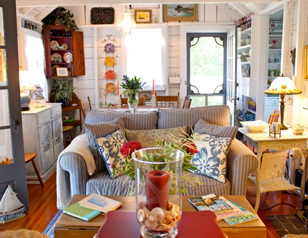 With its antique style and cozy interior, the Sound House is an adorable and intimate place to spend a vacation. The kitchen and bathroom were recently updated to make the cottage as convenient as it is cozy. Located at the end of a quiet lane, the Cottage on the Pond is a private escape from the crowds of summertime. If you get tired of the seclusion, Front Beach and the boutiques of Bearskin Neck are just a short walk away. The Cottage on the Lane has three bedrooms with breathtaking views of the ocean, and the summer weather is perfect for enjoying a family barbecue in the back yard. Each of these options is pet friendly, so feel free to bring your dogs and other furry friends. Moving into a summer rental in Rockport lets you take advantage of the town's limitless warm-weather activities. On nice days, you can take one of our bikes to explore the scenery of Cape Ann. The ocean offers excellent swimming, and walking along the numerous beaches is a perfect way to enjoy the fresh sea breeze. There is also plenty to do in the town itself, including one-of-a-kind shopping destinations and some of the tastiest fresh seafood in the Northeast. The majesty of the Atlantic Ocean has inspired countless painters, and you can visit one of Rockport's art galleries to witness their attempts to capture the beauty of the region.